This wide array of an eye-catching picture-based subtraction worksheets forms a perfect aid for little ones to learn single-digit subtraction facts from 1 through 9. 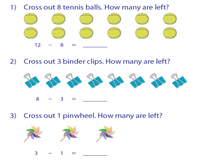 Mixed subtraction facts from 1 to 5 and 1 to 10 are also included. A number of free worksheets are at your disposal. Become a member to get unlimited access to the worksheets and unlock various download options. 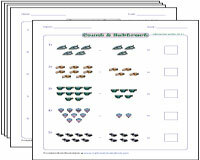 On display, here is a huge collection of vibrant picture worksheets featuring subtraction fact 1. Follow the instructions to cross out the pictures and complete each subtraction sentence. Bring out the sparkle in young ones with this array of worksheets that features 2 as the constant subtrahend. Get your kids to cross out and count the attractive pictures to determine how many items remain. This compilation of worksheets on subtrahend 3 will help strengthen your child's foundation in subtraction. These vivid worksheets provide for ample practice on crossing out images, counting and completing the subtraction sentences. Bolster young one's proficiency in subtraction with colorful worksheets that display 4 as the constant subtrahend. 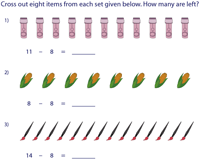 Enable children to count the pictures, subtract and write the answers. 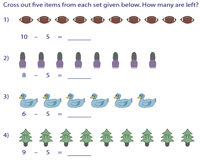 Use this selection of worksheets to reinforce the subtraction skills of little ones. 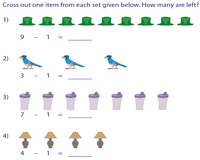 Cross out and count to complete the subtraction sentences provided in each delightful picture worksheet that features a constant subtrahend 5. 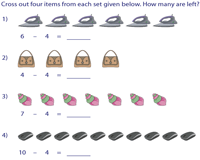 Challenge your child to complete this series of worksheets that have a constant subtrahend 6. Assist your child to complete these appealing picture-based sheets that provide rigorous practice. 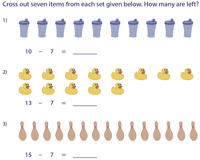 Capture your kid's attention with our best reinforcement exercise on subtraction with this assembly of enchanting picture worksheets that display 7 as the constant subtrahend. Transform young ones into budding scholars with our captivating worksheets that feature a constant subtrahend 8. Make use of our visually attractive worksheets to keep them thoroughly engaged with cross out and count activities. 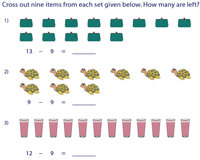 Employ this set of engaging teaching resources that provide for abundant practice on subtraction that displays a constant subtrahend 9. 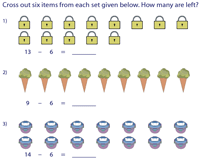 Use the answer key to help little ones verify their responses. 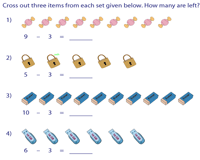 A perfect tool for parents and teachers to test your child's comprehension on subtraction facts from 1 to 5.
Review young ones expertise at solving this mixed series of alluring worksheets that feature subtrahends from 1 to 10. Our easy-to-print worksheets are sure to attract great participation from young learners. 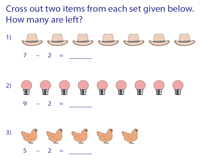 Click on the hyperlink below for an assemblage of worksheets on picture subtraction. Worksheets encompass cross out and count, column subtraction, dice subtraction, MCQs and substantially more!